Quality fitness professionals need to be able to inspire behavioral change in their clients. Change is often difficult for clients to maintain because habits are hard to break and short-term rewards can be more enticing than long-term gains. Fitness professionals should consider adopting Motivational Interviewing techniques to help clients make lasting change. Motivational interviewing is a communication technique that was pioneered by psychologists hoping to help those who suffer with addictions over come their self-destructive behavior. Overtime, motivational interviewing has been applied to help people make all kinds of positive behavioral changes including in regards to fitness. Asking your client open-ended questions ensures that the focus of the session is on their specific needs. 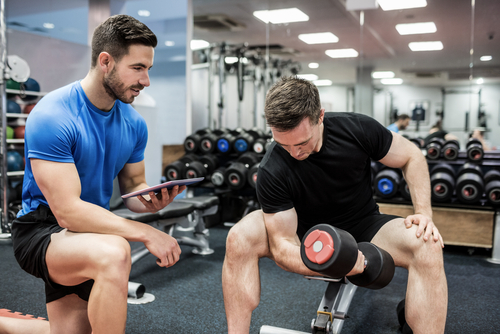 These questions will help your client come to their own conclusions about their fitness and make them feel more committed to the goals that they set themselves. When listening to your clients’ answers to your open-ended questions, you should be practicing your reflective listening skills. By repeating back to your client your interpretation of their answers you are helping them fully understand the nuances of their situation themselves. Summarizing is similar to reflections. At the end of your session, summarize what has been discussed to make sure that you and your client are on the same page. This is a good time to recap your client’s goals and what motivates them to reach those goals. Keeping the focus on the long-term benefits helps clients stay committed to change. Training your staff on these techniques will help to keep clients more engaged with their fitness goals. A more engaged clientele will not only stay customers longer but will also inspire word of mouth referrals. Learn more about how SinglePlatform can help your business gain more customers here.